You just want to get in shape, lose a bit of weight and maintain a healthy lifestyle, but you are not interested in bodybuilding or making your arms the size of your legs? You are at the right place. Start here! This workout is designed to tone your entire body and help burn fat to get you in your best shape, without burdening you with weights or additional equipment! The exercises here are some of the most popular around and cover most of the important muscle groups. In less than 12 minutes per day, you can build a body you can be proud of. Stand with the feet together and arms extended by your sides. Bend your knees slightly and push your body using the balls of your feet. Next, straighten your knees and use them to jump up while keeping your legs spread and hip wide apart. While jumping, raise your hands above your head until your hands touch together. Make sure to bring your hands to your sides again and your feet together while returning to the ground. Repeat without any pause for 60 seconds. Start with your back against a wall and your feet shoulder width apart, about two feet from the wall. Gradually slide your back down the wall until your thighs are parallel to the ground. Make sure your knees are directly above your ankles and keep your back flat against the wall. Hold the position for 60 seconds. 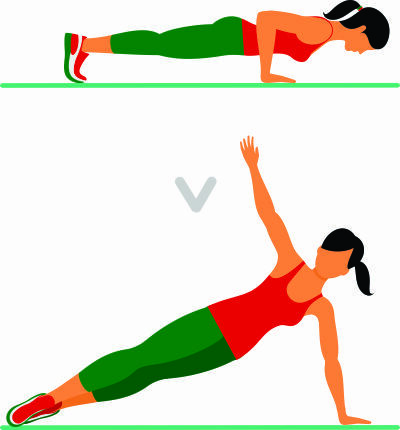 Start with your arms straight out, abs tight, holding your body in a plank position. Hands and arms are positioned slightly below the shoulders, fingers pointed forwards. Lower your body until your chest is an inch or two above the floor, elbows pulling back at roughly a 45 degree angle. Push your torso away from the ground until your arms lock, and then repeat as many as you can in 60 seconds. Lie down on your back and bend your knees, placing your hands behind your head or across your chest. 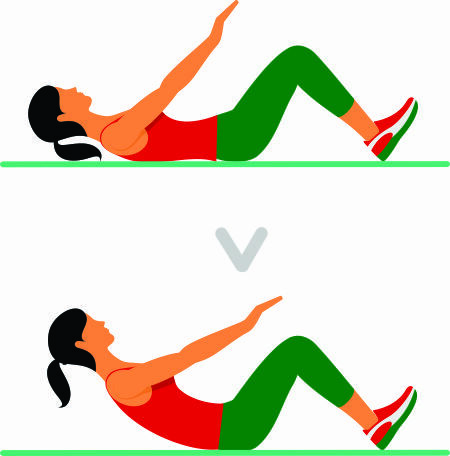 Pull your belly towards the spine, and flatten your lower back against the floor. Exhaling, slowly contract your abdominals, bringing your shoulder blades about one or two inches off the floor. Hold at the top of the movement for a few seconds, breathing continuously, and then slowly lower back down. Repeat as many as you can in 60 seconds. Find a bench, or a sturdy chair, that when you place your foot squarely on it, your knee is at a 90-degree angle or larger. Step up, leading with the right foot, then the left, bringing both feet completely onto the bench. Returning to the starting position, lead with the right foot to step down to the floor, then the left, until ending with both feet on the ground. Switch legs, and start stepping with the left foot. 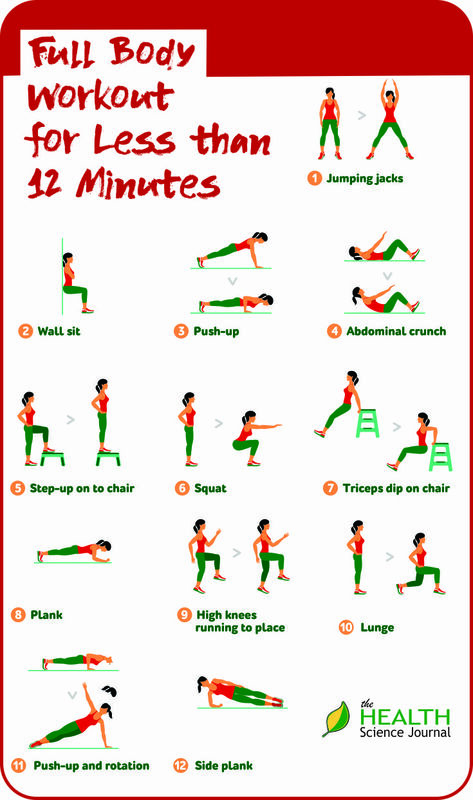 Repeat either move for a total of 45-60 seconds. Stand tall with your feet hip width apart and your arms down by your side. 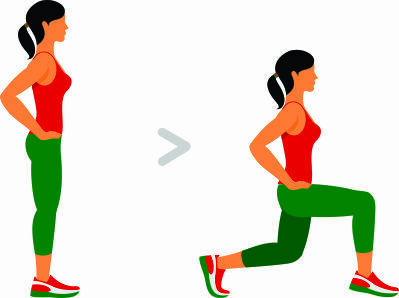 Start to lower your body back as far as you can by throwing your hips back, bending your knees and pushing your body weight into your heels. As you are lowering into the squat your arms will start to rise out in front of you for balance. Keep a neutral spine at all times and never let your knees go over your toes. Pause then lift back up in a controlled movement to the starting position. Repeat for 60 seconds. Sit on a chair, holding on to the edge with both hands, knuckles pointing forward. 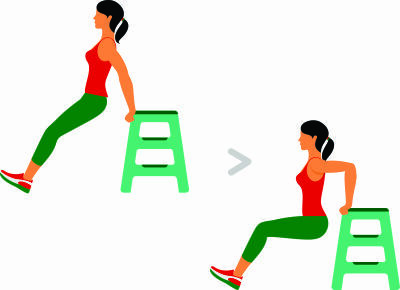 Slide your bottom off the seat and hold yourself up with arms straight, keeping your body close to the chair. 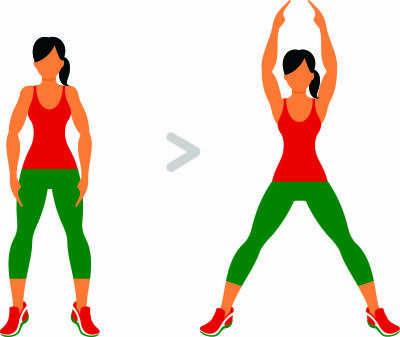 Gradually lower your body for two counts as you bend your elbows behind you. Straighten your arms for a count of two. Make sure your arms are supporting your weight throughout the motion. Repeat for 60 seconds. Get into a prone position on the floor, supporting your weight on your toes and your forearms. Your arms are bent and directly below the shoulder. Keep your body straight at all times, and hold this position for 45-60 seconds. To increase difficulty, an arm or leg can be raised. 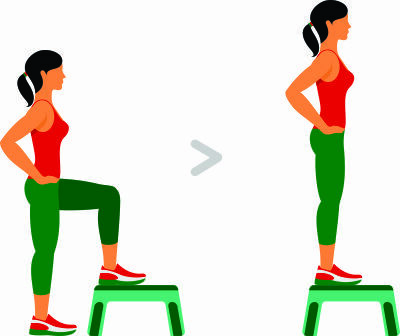 To perform this exercise, simply stand in one area and make sure your feet are approximately a hip-width apart. Push your knee towards your chest and place it quickly back on the ground. 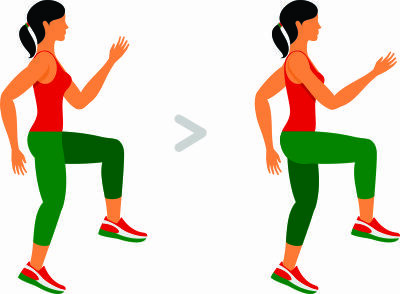 Follow this movement quickly by doing the same motion with the opposite leg. Repeat for 60 seconds. Start standing with your feet together, shoulders back, and core tight. Lift your right leg off the ground and take a big step forward. Lower your body toward the ground until your right upper thigh is parallel to the floor and your right knee forms a 90-degree angle. Straighten up by pushing through your right heel to return to stand. Repeat for 45-60 seconds. Begin in plank position with your feet together and toes on the floor and your hands placed slightly wider than shoulder-width apart. Draw-in your bellybutton and contract your glutes. With a flat back, slowly lower your body toward the floor, lowering and contracting your shoulder blades. 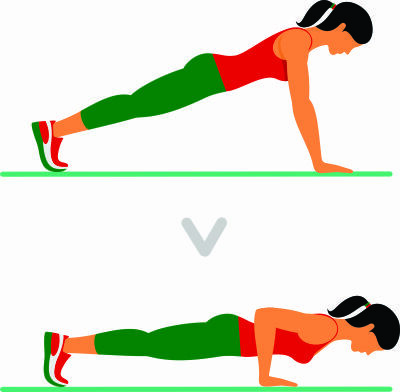 Push back up to starting position and rotate your body 90-degrees from the floor, fully extending both arms, one in the air and one on the floor. Reverse the movement of rotation to return to the starting position and repeat, alternating the direction of rotation for up to 60 seconds. Turn onto your right side with your legs extended and your feet and hips resting on the ground and stacked on top of each other. Place your right elbow directly under your shoulder to prop up your torso, and align your head with your spine. Gently contract your core and lift your hips and knees off the floor. Hold for 30-45 seconds and then return to the starting position. Roll onto the other side and repeat.